Written for students in their sixth year of primary school. 8 great new modules (Reggae Rhythms, Celtic Heartbeat, Pacific Harmonies, Latin Grooves, Blues Changes, Jazz Colours and Gospel Voices + a module for detailed evaluation). Each module explores: chords and harmony, rhythmic & melodic composition, improvisation and lyric writing. The final module is a fabulous ‘Spicks & Specks/RocKwiz/Never Mind the Buzzcocks’ style, team-driven multimedia game show. It includes over 30 videos: demonstrations of instruments, techniques & styles by specialist musicians, demonstrations of tuned and untuned percussion techniques, chord theory and much more (including material for use in the Music Quiz in module 8). Also includes bonus access to web extras: extensive background information, material, and useful links for the various musical styles covered + additional scores. 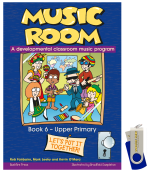 Music Room Book 6 +USB provides the full program in a physical book, with all audio visual included on a USB. Here is a copy of the contents page for Music Room 6. To see what a lesson looks like, access the free lessons available under the Product Samples menu.